To Henry Ward Beecher it was a staggering blow. He felt humiliated and disgraced beyond any power to save him. In his grief and shame, he went to his friend, Theodore. And Theodore Tilton did not lose an instant. He went straight to Washington, and to the house of Secretary of War Cameron. Cameron had guests to lunch; but Tilton would not be put off. So the Secretary asked Tilton to top to luncheon, also. Tilton was one of those rebellious New York editors who sought to replace President Lincoln as the Republican nominee in August 1864. But after the Democratic nomination of George B. McClellan, Tilton told Anne E. Dickinson: “I was opposed to Mr. Lincoln’s nomination but now it becomes the duty of all Unionists to present a united front.”13 Tilton’s conversion was reflected in his letter of congratulations to President Lincoln on November 12. I have thanked God every waking hour since the Eighth of November. That day was the greatest in the history of the present generation. On that day Providence so signally interposed to rescue the Republic from its enemies that all Christian patriots are filled with a solemnity of rejoicing. And for yourself, Sir, prayers go up now as never before. The people are with you now as never before. May God keep you in health and strength, and give you the victory! Elicited a popular verdict in favor of annexation, induced the same Congress to vote for what it had voted against. It would add to the glory of the 38th Congress if, in its last session, it should reverse its unhappy decision of the first. Permit me to remind you that no man on the Earth has such an opportunity as yourself for promoting Human Liberty. It wasn’t just with President Lincoln that Tilton’s relationships were difficult. Beecher biographer, Lyman Abbott wrote that by 1870 “Tilton had proved to be more brilliant as a newspaper writer than sagacious as a newspaper leader. 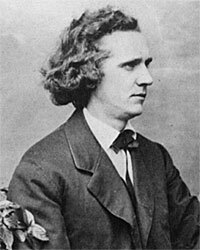 His utterances on religious questions were increasingly distasteful to the orthodox churches; and the orthodox churches were the constituency to which in the past ‘The Independent‘ had appealed.”16 Tilton had become the official editor of The Independent in February 1864. He later edited the Brooklyn Union and founded the weekly Golden Age. Despite these successes, Tilton’s professional and personal lives headed for a crisis. Tilton “liked to go off on long, strenuous lecture tours, leaving Liz and the children behind. 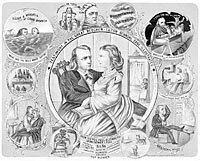 Liz, a former Sunday-school teacher, worshiped ardently at Dr. Beecher’s church, and during Theodore’s long absences Beecher also ministered privately to her,” wrote Horace Greeley biographer William Harlan Hale.17 Lyman Beecher Stowe presented a different version of what happened between the Tilton and Beecher families: “Tilton himself not only advocated free love but practised it with promiscuous vigor, particularly when away on lecture tours. He finally wrote an editorial which, in effect, committed the paper to free-love views, a novel stand for a religious publication.”18 Tilton subsequently charged Beecher with seducing his wife. The resulting scandal was aired in a courtroom and in church pews. It involved a complex myriad of charges, countercharges, retractions and reassertions. It was an unholy mess. William Harlan Hale, Horace Greeley: Voice of the People, p. 289. Andrew A. Freeman, Abraham Lincoln Goes to New York, p. 15. Paxton Hibben, Henry Ward Beecher: An American Portrait, p. 141. Lyman Beecher Stowe, Saints Sinners and Beechers, p. 308. Paxton Hibben, Henry Ward Beecher: An American Portrait, p. 142. Paxton Hibben, Henry Ward Beecher: An American Portrait, p. 144. Paxton Hibben, Henry Ward Beecher: An American Portrait, p. 157-158. Abraham Lincoln Papers at the Library of Congress. Transcribed and Annotated by the Lincoln Studies Center, Knox College. Galesburg, Illinois. (Letter from Theodore Tilton to Abraham Lincoln, October 28, 1863). Abraham Lincoln Papers at the Library of Congress. Transcribed and Annotated by the Lincoln Studies Center, Knox College. Galesburg, Illinois. (Letter from Theodore Tilton to Abraham Lincoln, February 4, 1863). John Niven, Salmon P. Chase: A Biography, p. 361. Charles M. Segal, editor, Conversations with Lincoln, p. 352(Letter from Theodore Tilton to Anna E. Dickinson, September 30, 1864)..
Abraham Lincoln Papers at the Library of Congress. Transcribed and Annotated by the Lincoln Studies Center, Knox College. Galesburg, Illinois. (Letter from Theodore Tilton to Abraham Lincoln, November 12, 1864). Abraham Lincoln Papers at the Library of Congress. Transcribed and Annotated by the Lincoln Studies Center, Knox College. Galesburg, Illinois. (Letter from Theodore Tilton to John G. Nicolay, November 12, 1864). Lyman Abbott, Henry Ward Beecher, p. 290. Lyman Beecher Stowe, Saints Sinners and Beechers, p. 309. William Harlan Hale, Horace Greeley: Voice of the People, p. 328.